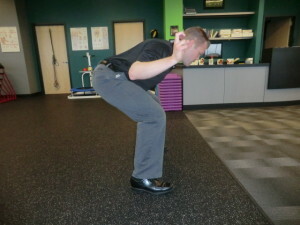 If there was one exercise that all people need to perfect is the squat – athletes or not. We’re not necessarily talking about putting a bar on your back and doing maximal effort squats. We’re alluding to simply performing sit to stand from a chair, or getting on/off the toilet with proper squat technique. That said, so many compensatory patterns and muscle substitutions take place from the ankle to the trunk. This is one of the first things we look at during a physical therapy evaluation, and you may not even know it, but we’re looking the minute we see you in the waiting room. Watching you get up from the chair is the first clue as to how you are performing this activity. We almost immediately have an opportunity to help you or your loved one before we’ve even talked! 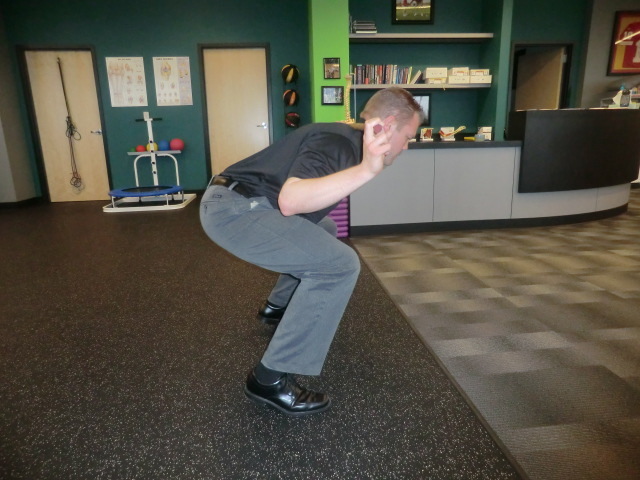 There are many reasons that poor squat form can occur – lack of mobility in the hips, knees, or ankles or lack of stability in the core region. Figures 1 and 2 show some poor squat form because of these areas. Figure 1 shows the subject leaning forward, and Figure 2 shows the heels elevated. In figure 3, the subjects knees are collapsed in and the feet are turned out. You may have one or all of these regions causing you to not perform a proper squat. We can help you determine which areas are the sources of your dysfunction. 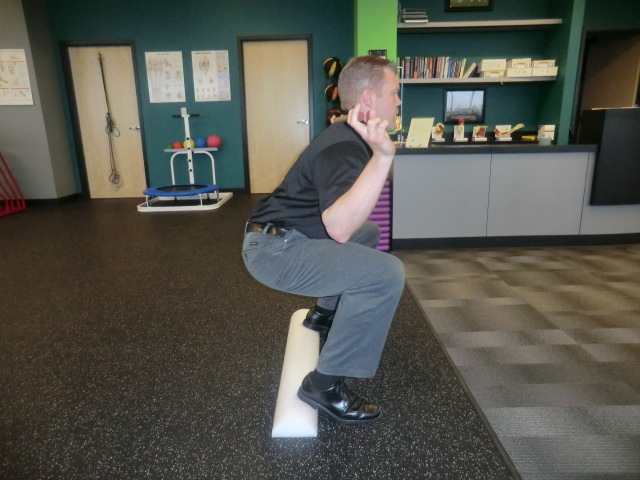 The purpose of this blog post is to talk about some ways to perform a proper squat movement to not only help improve function, young or old, but for the active patient, provide a foundation for more advanced leg strengthening. 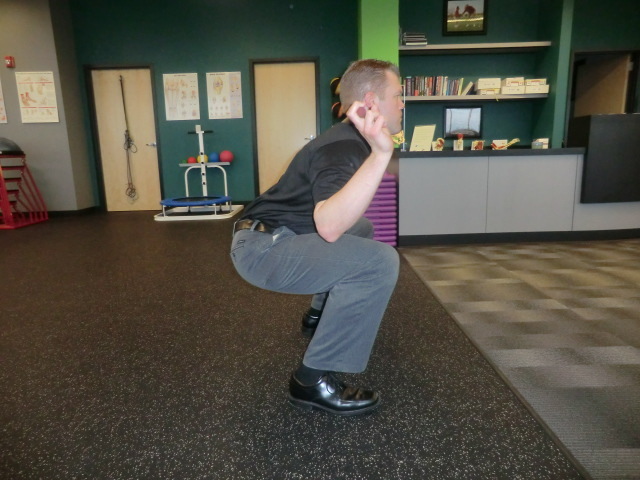 The squat is not only a basic tenet of movement in general, but also part of a strengthening program. The body weight squat should be perfected prior to adding external resistance. Are you Figure 1? If you look more like figure 1 with a forward trunk lean and not so great depth, more than likely you have tight hips and/or core and hip weakness. Both are easy fixes! Are you Figure 2? You may have both of Figure 1 deficits, but if your heels are coming up, you may have tight calves or an ankle mobility restriction. Perhaps you had a previous ankle/foot surgery and your mobility has been affected? We can figure that out in an evaluation. Are you Figure 3? If you’re figure 3, more than likely you have some or all of the deficits in figures 1 and 2! First of all, see Figure 4 for good squat form. The feet are slightly more than shoulder width apart, the trunk is leaned forward, the head is up, the trunk is parallel with the “shin” bones. The curve in the low back is maintained. Many people struggle with achieving these basic points. Sometimes it’s a MOBILITY problem why we can’t get there. 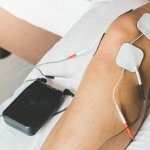 Perhaps with arthritic aging joints or tightness in muscles from sitting in front of a computer all day, you may not be able to get in that position. Conversely, you may have a STABILITY problem. We know this by watching you squat by yourself, then having you repeat it while we hold your hands, supporting you. If you increase your depth and your form improves, we know that you’re using us for stability. 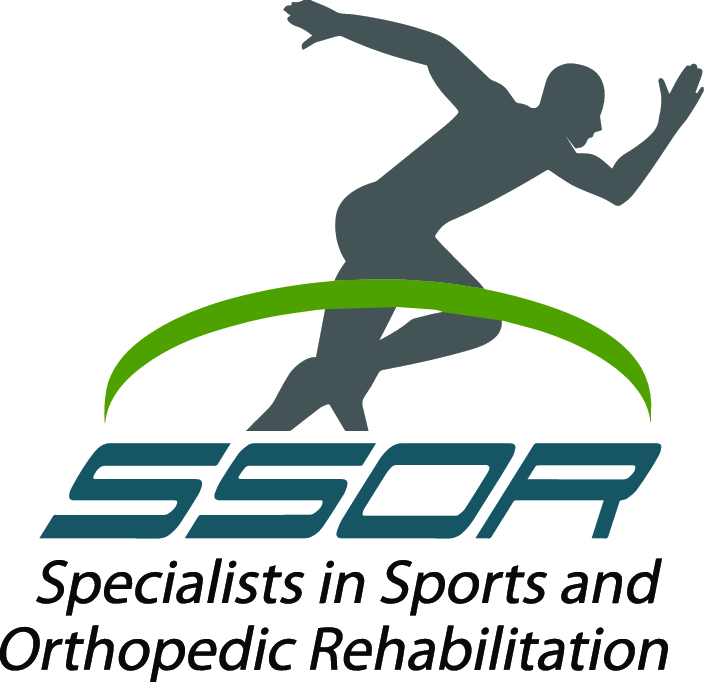 Therefore, we know our targeted interventions here will focus on hip and core stability training. In figure 5, you’ll see the subject holding on to a cable attached to a weighted stack. Basically, what this provides the subject is some stability as they descend. Usually, people stop their descent with the squat because any lower, they will fall back. 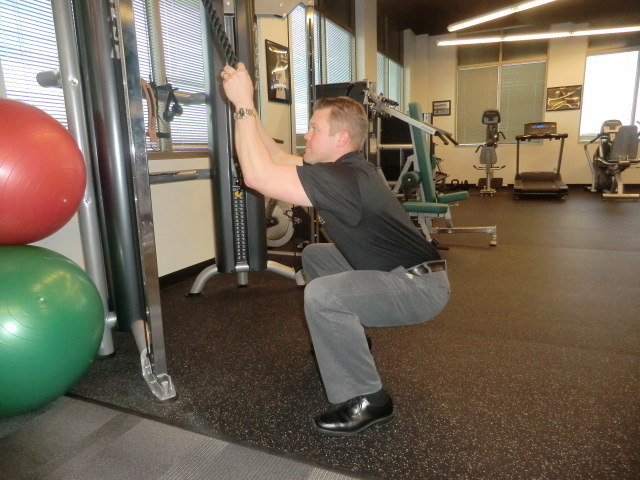 You can confirm this by getting to the bottom of the squat and then letting go of the cable – if you fall backward, you are the ideal person to need this! As you get better at this, you can release one hand, try and hold on less, or get to the bottom and pause without holding on. If you don’t have a cable or are teaching this to a relative at home, any immovable object that the person can hold on to will work. Exercises to strengthen your core and hip muscles should compliment this activity however. One of our physical therapists can show you a comprehensive program to address this. Maintaining proper form and posture is paramount when you do this though. In figure 6, you’ll see the subject’s feet are elevated. This is actually a way to help someone squat with tight calves or lack of ankle mobility from joint or soft tissue restrictions. Again, these issues can be addressed in physical therapy. However, this method is also good because by virtue of shifting weight to the toes, the hips have to go backward – equal and opposite reaction. As you improve, you can either lower the height your heels are elevated or use nothing at all. 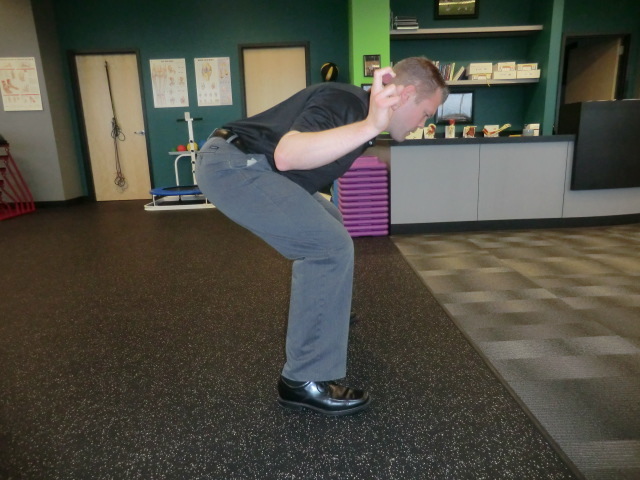 The elevation of the heels effectively acts as a “buffer” or “buys you time” until ankle or soft tissue mobility is restored in physical therapy. We don’t let people cheat, but this is a way to let you cheat until you have the mobility and control you need. Hopefully, these tips help you perform a proper squat. 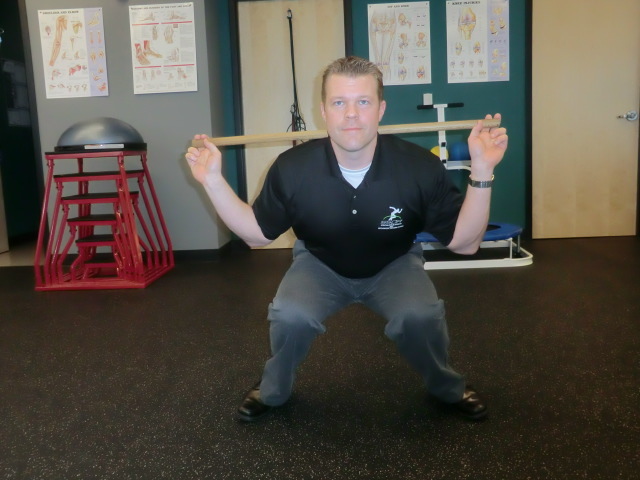 You can use these tips to teach a child or an elderly relative how to perform a proper squat. It would be a privilege to partner with you in your care. Remember, you can see a physical therapist in Kansas without a physician referral. Give us call! We have locations in Overland Park and Prairie Village to serve you.